Now that you have seen the health benefits of rowing machines, you are probably ready to get started using one of these pieces of gym equipment. Whenever you are about to use a new piece of equipment at the gym or home, it is a good idea to first familiarize yourself with the best use practices. This way, you will reduce the chances of injury as well as maintain proper form so that you get a great full body workout. So, before you start working out on the rower, first read up on the tips provided below for proper use of a rowing machine. If you bought an indoor rowing machine for home use, then you need to select a place for it that offers ample space for the full arc of the rowing motion. And the floor that you put it on needs to be a level, solid one. If you have not yet purchased your machine, you can measure your available space first and then compare it to the specs of machines that you’re considering to ensure that you get something that is a good fit. Keep in mind that some home rowing machines can be folded and stored in a vertical position when they are not in use. The great thing about a rowing machine is that it gives you a great full body workout that ones both your upper and lower body. Your shoulders are the most targeted area of your upper body that will get the most workout and toned. And your legs and glutes are the area of the lower body that get the most targeted toning from your workouts. Choosing a machine with a seat that slides with your stroke movement offers the best chance at toning your lower body. Those machines with stationary seats do not offer the lower body toning capability that the sliding seat models offer. Even if you have to spend a little more for this design, it is totally worth it for your health and fitness. Employing the proper form and positioning is vital when it comes to getting the most out of your rowing machine. Correct form and posture tones and works you out in the all the right places while preventing any injuries to your back due to strain from improper form. As you gain confidence and comfort using the machine, you can boost up the resistance level to give your body a more challenging workout. A typical user error that occurs on rowing machines is when you let your knees flex before your hands pass over the knees during the recovery phase of the stroke. The reason that this is a problem is because it forces you to lift up the oar handle over the knees before you come into the catch position, and that can result in an injury. Another common user error is if you let the seat slide out from under you before the handle moves back in the drive position. The problem with this error is that it can result in a back injury if enough force is used. 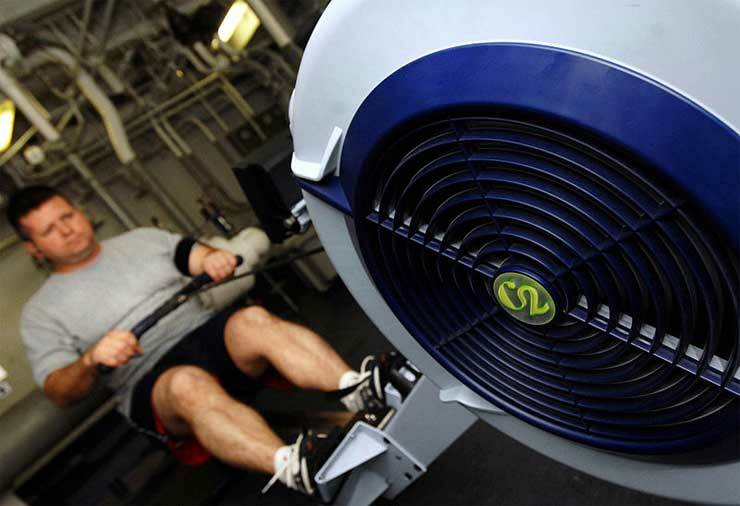 When you do the rowing stroke, the effort put into it is a combo of the resistance setting and the stroke rate. And the slower your stroke rate, the more stress you are putting on your back. For long aerobic workouts on the machine, you should put the resistance setting lower. As a beginner, aim for 15 minutes of aerobic training that starts with a 5-minute warm-up period and ends with a 5-minute cool down period. After rowing regularly for weeks or months, you can (and should) increase the length of your workout as your fitness level increases. Both resistance and stroke rate should be increased because if you attempt to use a lower stroke rater with a higher resistance, then you run the risk of a back injury. In your workouts, the pace needs to be reached over three to five strokes (or more). For your warm-up, do some slow and easy strokes for about five minutes. This boosts the benefits of your workout and reduces that chance of injury. Do NOT make a sudden hard as possible pull in an attempt to maximize your efforts in a single to two strokes. This puts a sudden and severe stress on your lower back and can cause a painful injury. When it comes to proper positioning, focus on using your legs to push and not your back. This prevent injury and maximizes the toning benefits of your workout. You should also focus on smooth, fluid movements instead of jerky or choppy ones. Proper posture is also important. Resist the urge to lean forward in the catch position or backward when finishing the stroke. By following the tips above, you can get the most benefits from your workout.